Webb & Cook Arboricultral Specialists Ltd - Tree Surgeon based in Crondall, Surrey. Webb & Cook Arboricultural Specialists Ltd are a privately-owned company with a combined experience of thirteen years within the industry. We are a professional outfit providing a very high standard of tree care throughout the South East. 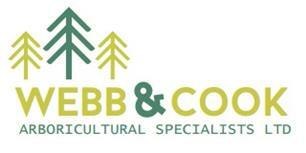 Webb & Cook offer all aspects of arboricultural from tree pruning, felling, tree planting and also planning applications. Simply, if it’s to do with trees we can do it. Most of Webb and Cook's work is gained by recommendation, and repeat custom. Our friendly team are fully qualified NPTC professional arborists, who offer a friendly and efficient service. Our clientele is both residential and commercial which includes Schools, Building companies, Golf Courses, Management Companies and Landscaping businesses. To ensure the highest standard of Health and Safety is applied we comply with all the latest safety regulations and work to British Standard 3998. Why choose Webb & Cook? To see our list of services we provide please visit our website www.webbandcookarb.co.uk. Please contact us for your free no obligation quote. We work in Hampshire, Berkshire and Surrey.